A 11 year old boy underwent an orchiectomy for an undescended testicle (cryptorchidism). 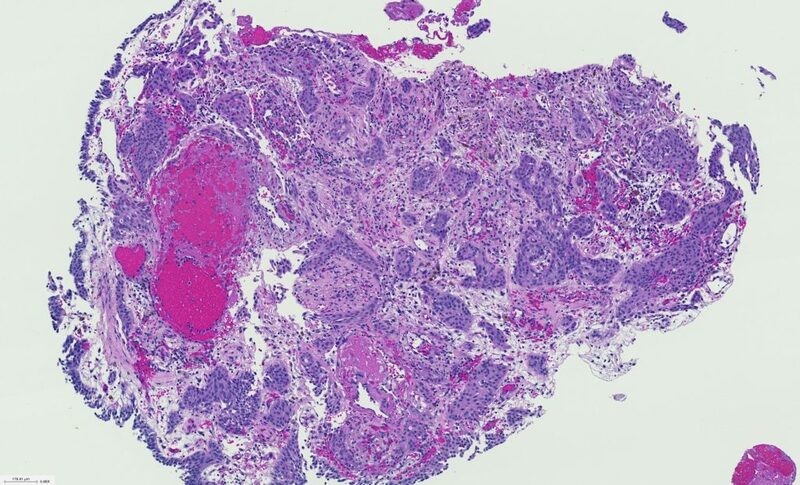 Discussion: Germ cell neoplasia in situ (GCNIS) is the new nomenclature for what was formerly called intratubular germ cell neoplasia. It is the precursor lesion to invasive germ cell tumors in post-pubertal males. GCNIS is associated with up to a 50% risk of developing invasive germ cell tumor within 5 years if untreated and up to 90% risk in 7 years. The risk of germ cell tumor is also increased in the contralateral testis. Associated risk factors include cryptorchidism (4% risk) and infertility (1%–2% of biopsies) and much higher in intersex disorders. GCNIS is almost always seen adjacent to malignant germ cell tumors in post-pubertal males. 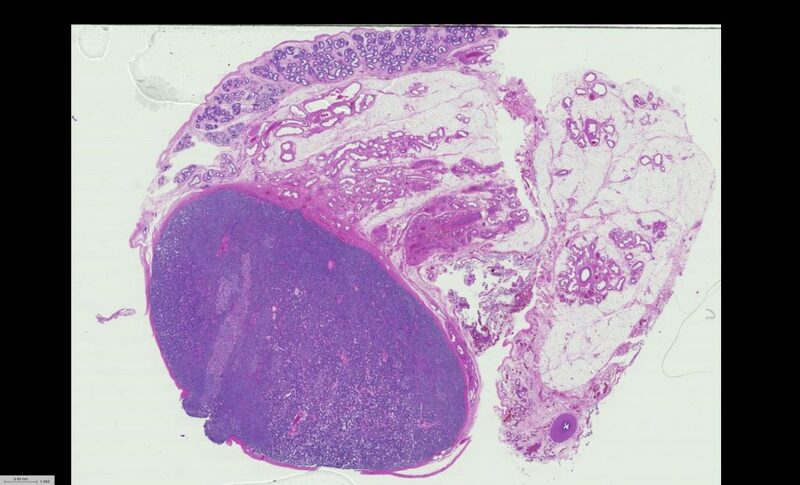 It is absent adjacent to pre-pubertal-type teratomas, epidermoid cysts, and prepubertal yolk sac tumors. The average age where GCNIS is seen is 15–35 years, and extremely rarely seen in prepubertal testes apart from an intersex disorder. Consequently, the finding of GCNIS in the current case is unusual. GCNIS occurs only in tubules lacking spermatogenesis. Within these tubules are enlarged cells along the periphery of the tubules with clear cytoplasm, irregular nuclear contours, coarse chromatin, and enlarged single or multiple nucleoli, resembling seminoma cells. In contrast, immature germ cells in prepubertal testes are small with round and regular nuclear contours, densely packed chromatin and no nucleoli. Occasionally, spermatogonia are otherwise identical, yet can be binucleated or have enlarged nuclei (giant spermatogonia). PLAP and OCT4 can sometimes be seen in infants but subsequently are negative in nonneoplastic germ cells, where PLAP and OCT4 positivity are excellent specific markers of GCNIS. Surgically bringing the testis into the scrotum even before 2 years of age is not entirely protective of subsequent neoplasia. 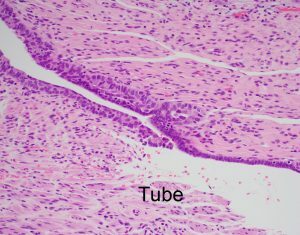 In some cases, especially if the cryptorchid testis is intra-abdominal where there is a higher risk of developing germ cell tumors compared to cryptorchid testes closer to the inguinal canal, orchiectomy may be performed. A 50 year old woman with a history of leukemia treated with chemotherapy presented with hematuria and was biopsied. Discussion: Pseudocarcinomatous urothelial hyperplasia (PCUH) is a late reactive process to bladder ischemia. In most cases, it is seen several years following radiation to pelvic organs with most common a history of prior irradiation for prostate cancer. Less frequently there is a history of systemic chemotherapy, severe systemic ischemic disease, indwelling catheter, or sickle cell disease. 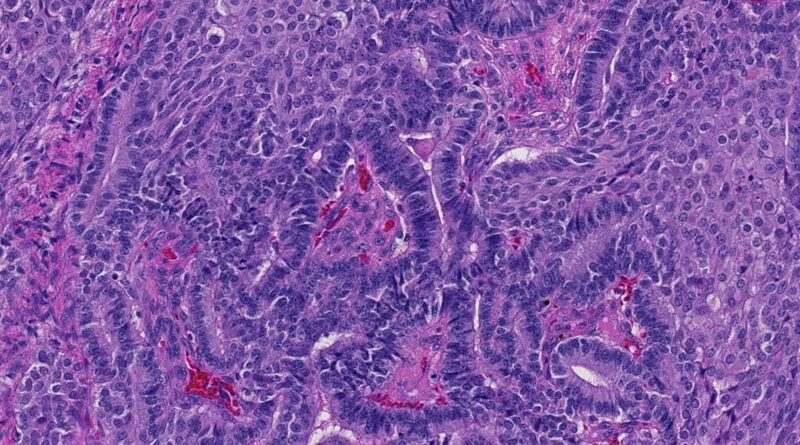 Architecturally, it resembles infiltrating urothelial carcinoma with nests of urothelial cells irregularly within lamina propria. 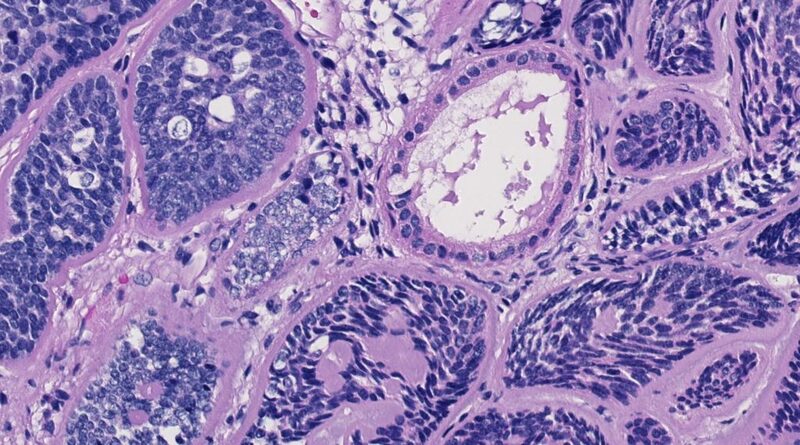 The nests do not involve the muscularis propria; if there are nests of urothelium in the muscularis propria then it is invasive urothelial carcinoma and not PCUH. 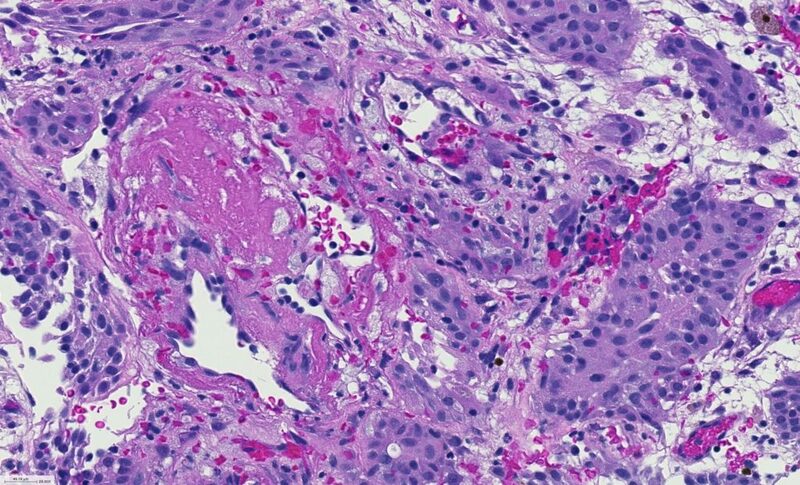 The key to recognizing PCUH is not focusing on the nests of urothelium but recognizing the background stroma with numerous vessels having fibrin thrombi, recent hemorrhage and, extensive hemosiderin deposition, and in most cases prominent acute and chronic inflammation. 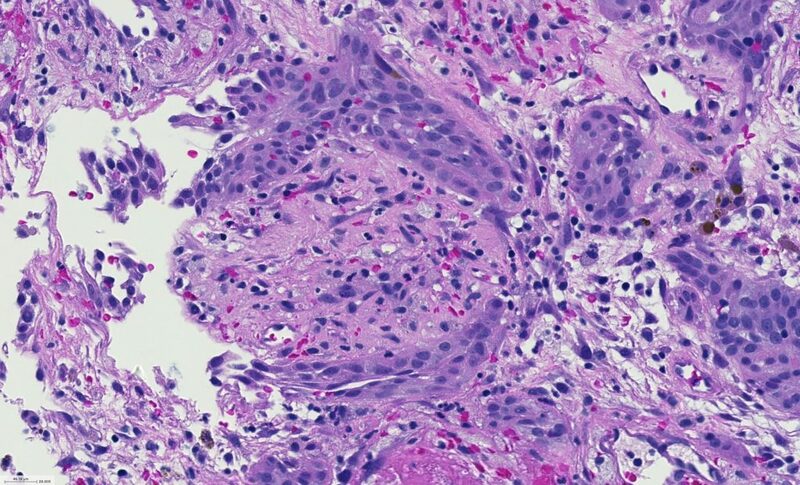 Infiltrating urothelial carcinoma does not have fibrin, extravasated red blood cells and hemosiderin as a reaction in the adjacent stroma. As PCUH is a reactive process, the urothelium can have mild to moderate nuclear atypia and mitotic figures can be seen in 25% of cases. Overlying ulceration is present in 40% of cases. Vascular changes associated with prior irradiation can often be found. Typically the pathologist does not get a history of prior radiation or other ischemic etiologies and needs to call the urologist for this information which helps to confirm the diagnosis. 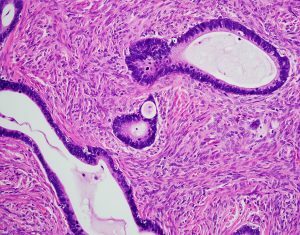 Although PCUH mimics infiltrating urothelial carcinoma, it is not associated with an increased risk of carcinoma. A 55 year old female was noted to have a kidney mass. 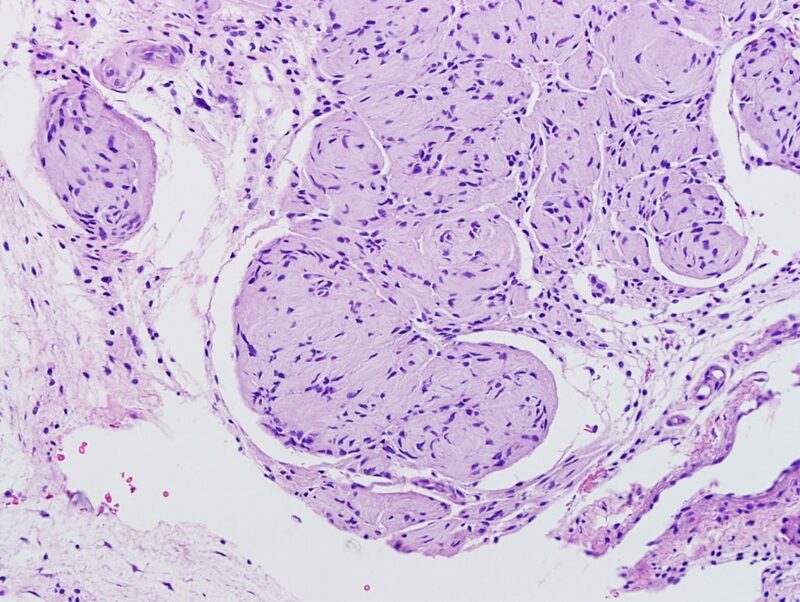 Histological Description: The nephrectomy specimen shows a nodule and a rim along the renal capsule of pale and eosinophilic cells adjacent to and focally infiltrating the kidney. The cells within the nodule are arranged in compact small nests and cords. The paler cells are notable for finely vacuolated cytoplasm. 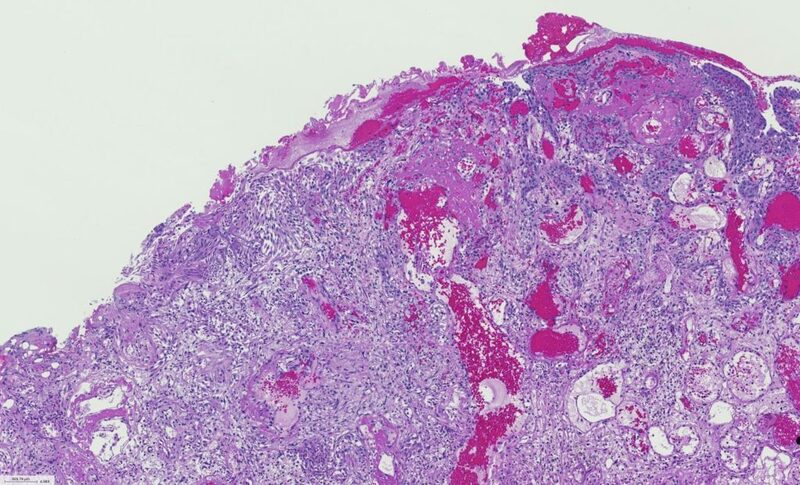 The nodule despite its infiltrative appearance lacks cytological atypia, mitotic figures, necrosis, or vascular invasion. Discussion: Renal-adrenal fusion varies in its growth from subcapsular lesions that are plaque-like, wedge-shaped, or spherical to irregular nests deep in the renal parenchyma. The adherent and intrarenal adrenal tissue is composed of adrenal cortical tissue, with no adrenal medullary tissue present. 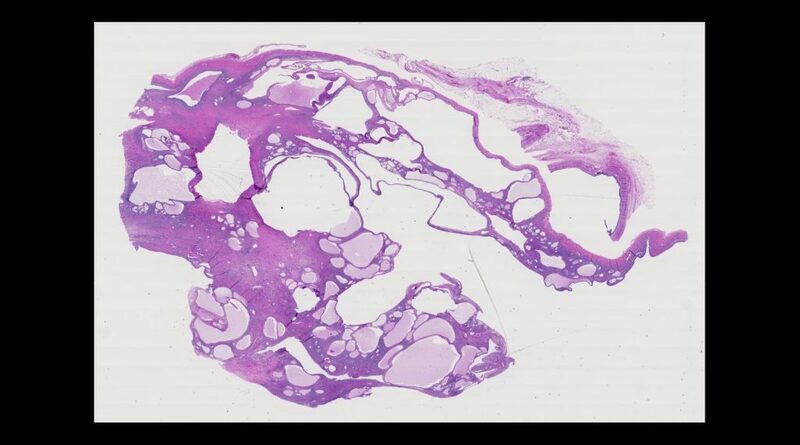 At the base of the subcapsular adrenal tissue, a complete fibrous septum separating the adrenal tissue from the renal parenchyma is infrequently present. 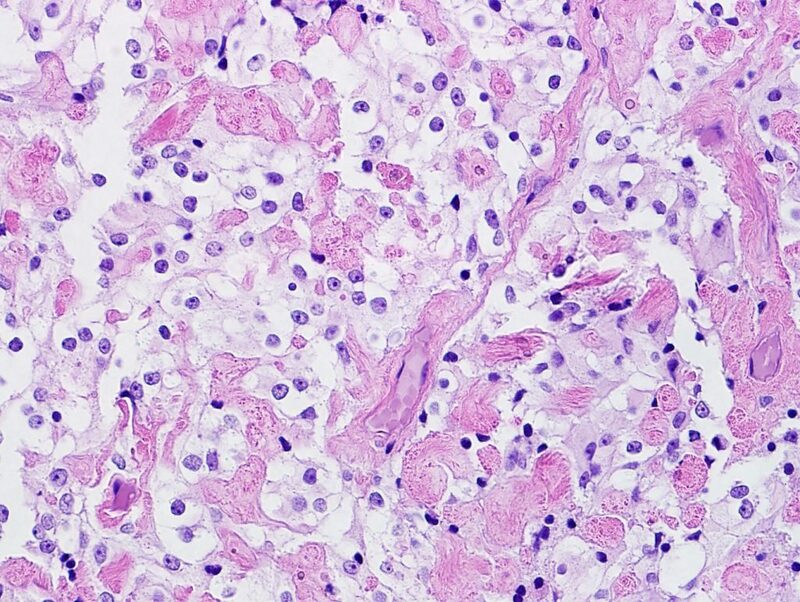 In the most cases there are nests of clear cells or eosinophilic cells in direct contact with the renal parenchyma. 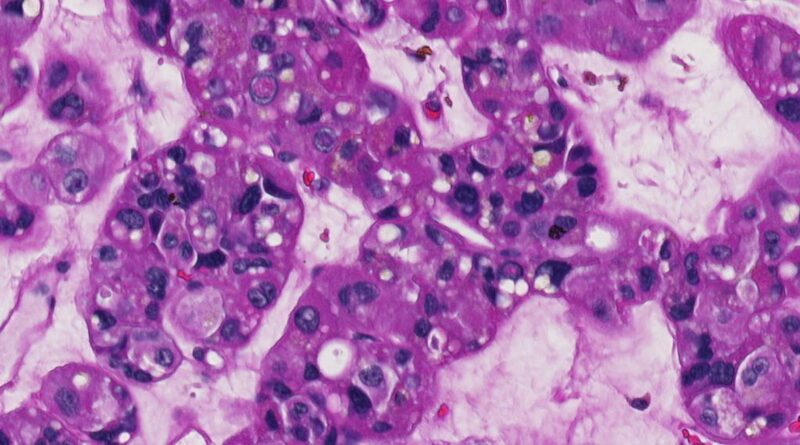 In some cases, adrenal tissue focally extends into renal parenchyma in an infiltrative manner, as seen in this case. In a minority of cases of renal–adrenal fusion, the normal adrenal architecture is well maintained with identification of the three zones of cortical cells. 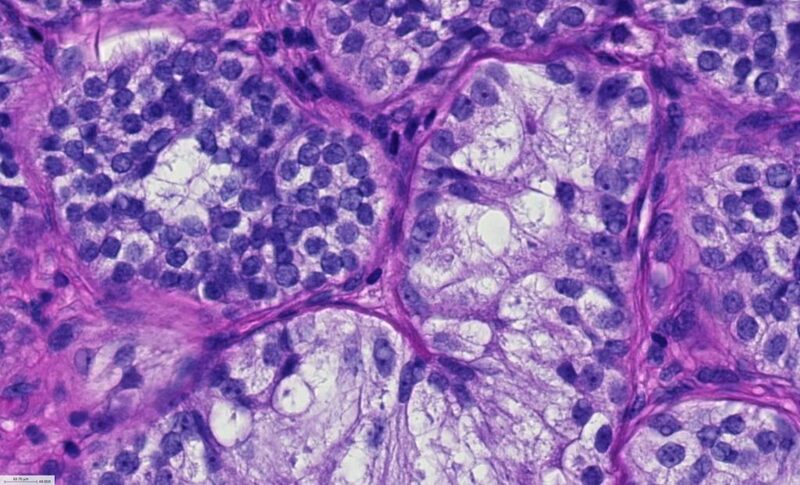 The large clear cells have a characteristic microvesicular pattern, which differs from the dissolved empty cytoplasm of clear cell renal cell carcinoma (RCC) and the fine lightly eosinophilic cytoplasm of chromophobe RCC. 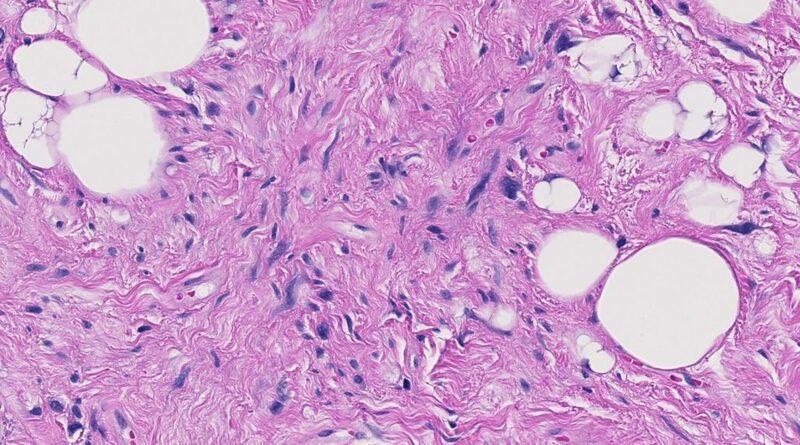 Adrenal cortical tissue is usually positive for inhibin, SF-1, and melan A, and negative for PAX8 and pancytokeratin with the opposite pattern for clear cell renal cell carcinoma. 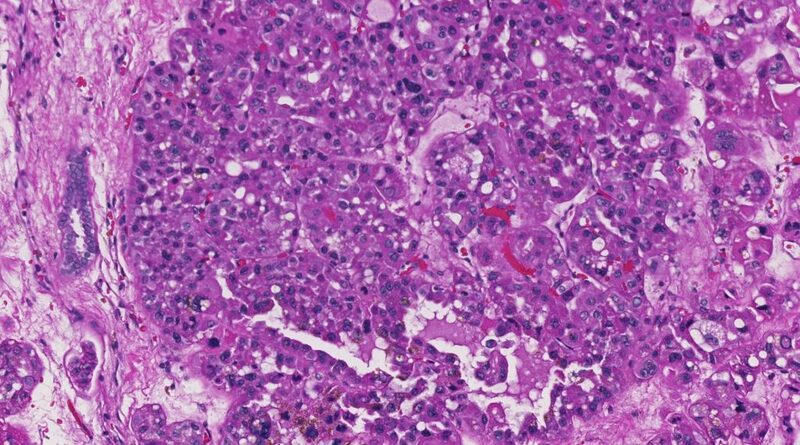 Rarely, neoplasms can arise in ectopic adrenal tissue or in cases of renal–adrenal fusion, where involvement of the kidney should not be mistaken for malignancy in an adrenocortical neoplasm. 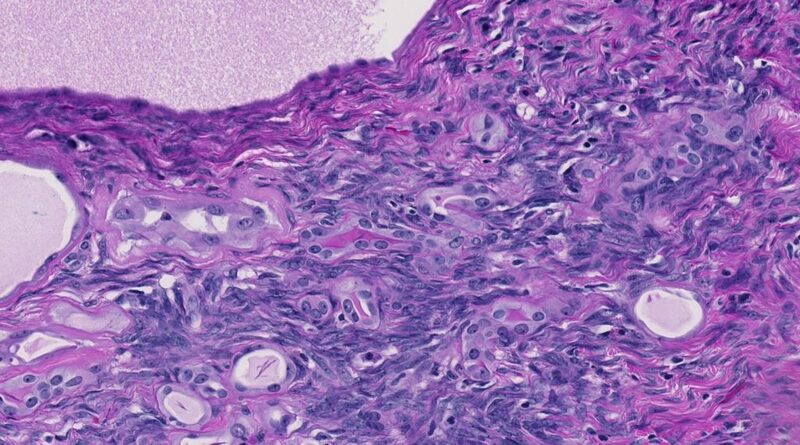 In this case, the adrenal cortical tissue is too expanded for normal adrenal cortical tissue and since a solitary nodule is consistent with an adrenal cortical adenoma arising in renal-adrenal fusion. 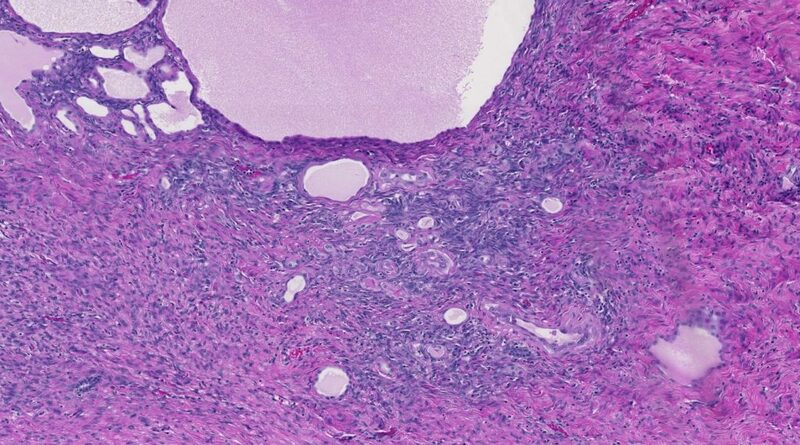 The expanded adrenocortical tissue of the adenoma lacks features of malignancy other than infiltration of the kidney, which is not atypical in this setting. 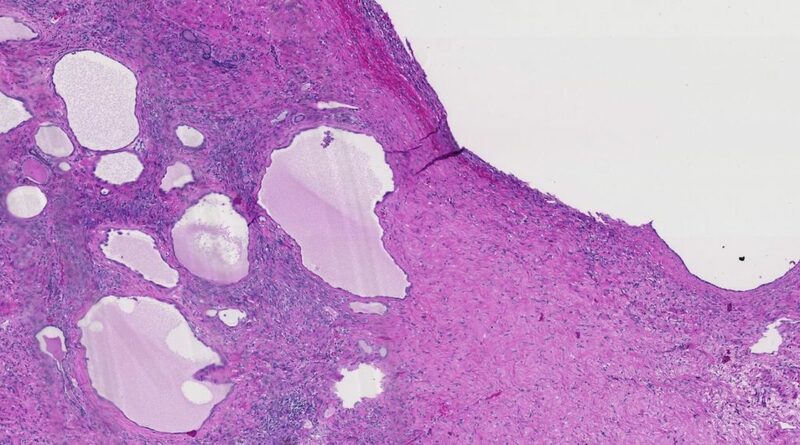 The cells have no cytologic atypia, not mitotically active, lack necrosis, and show no lymphovascular invasion. Reference: Ye H, Yoon GS, Epstein JI. Mod Pathol. 2009 Feb;22(2):175-81. Brain mass in a 40 year-old woman. 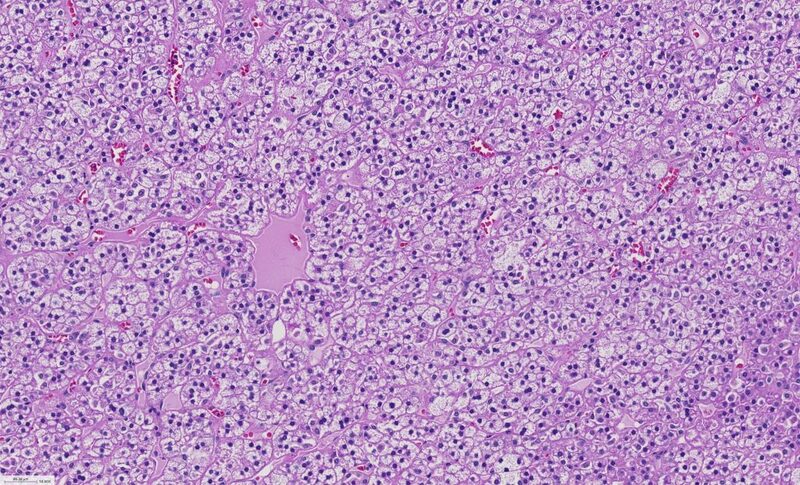 This is a brain mass in a 40 year-old woman. 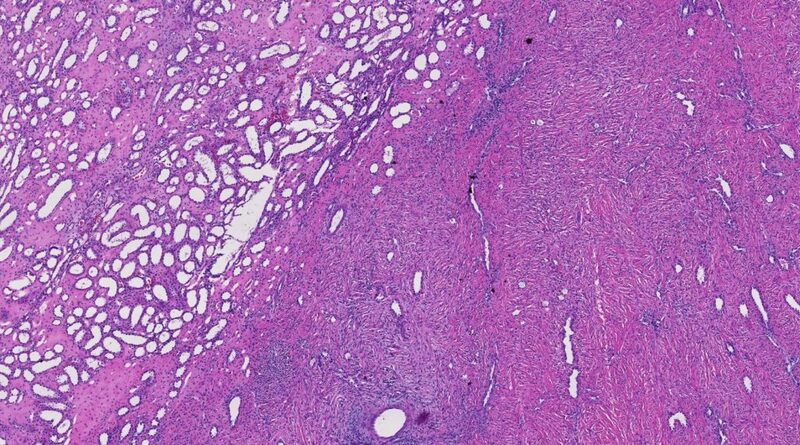 Histology: The lesions is predominantely comprised of oval-epitheliod cells arranged in clusters, cords and trabeculae in a myxoid matrix. The cells have eosinophilic to focally clear and vacuolated cytoplasm and virtually no atypia. 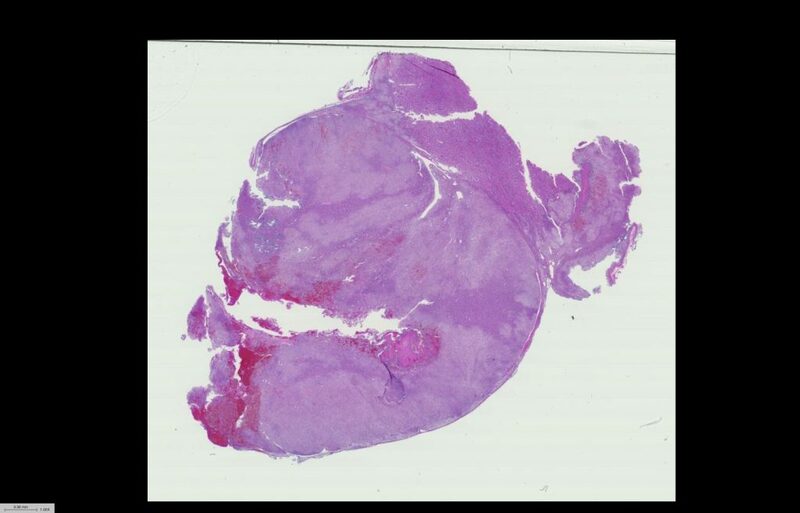 This is a thyroidectomy from a 35 year-old woman. 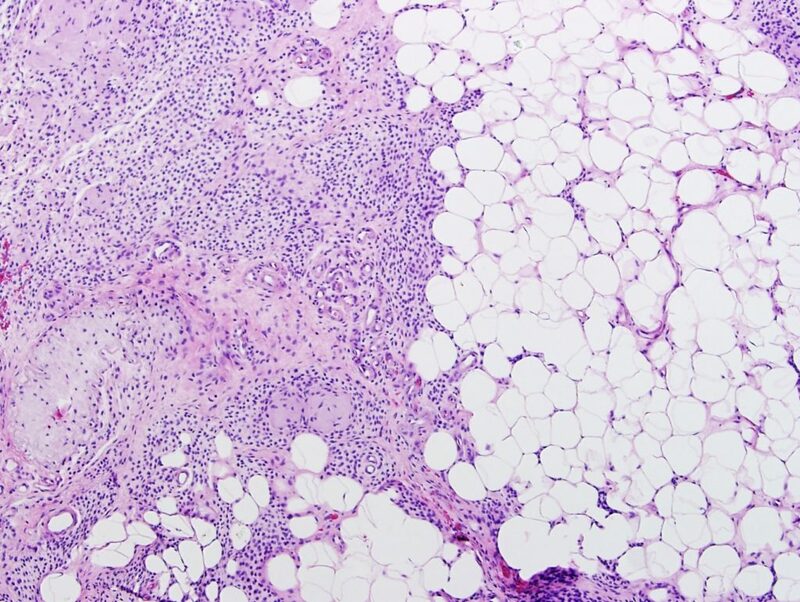 This is a thyroid mass from a 35 year-old woman. 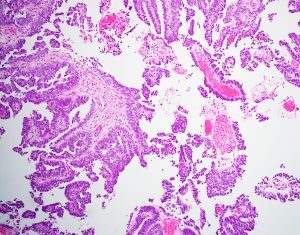 Histology: The tumor shows a combination of histologic patterns with hyperchromatic, columnar cells showing pseudopalisading arranged in predominantly papillary and follicular patterns with focal cribriform architecture combined with paler, pink, round cells in solid sheets and whorls (squamous morules). 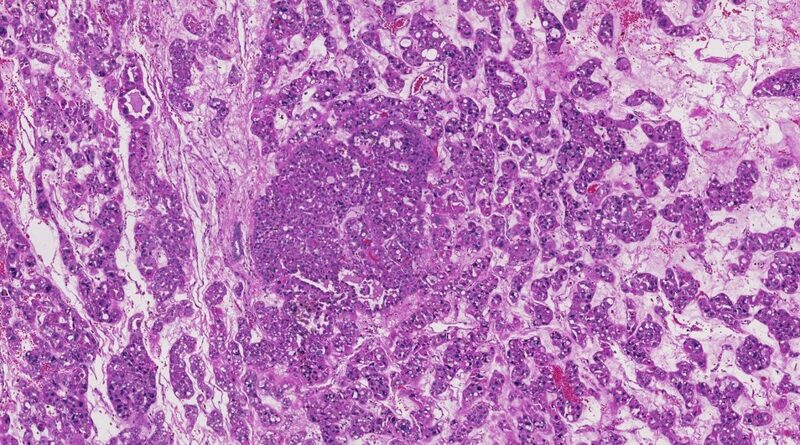 Discussion: Cribriform-morular is a rare variant of papillary thyroid carcinoma (PTC-CMV) most commonly seen in young women. 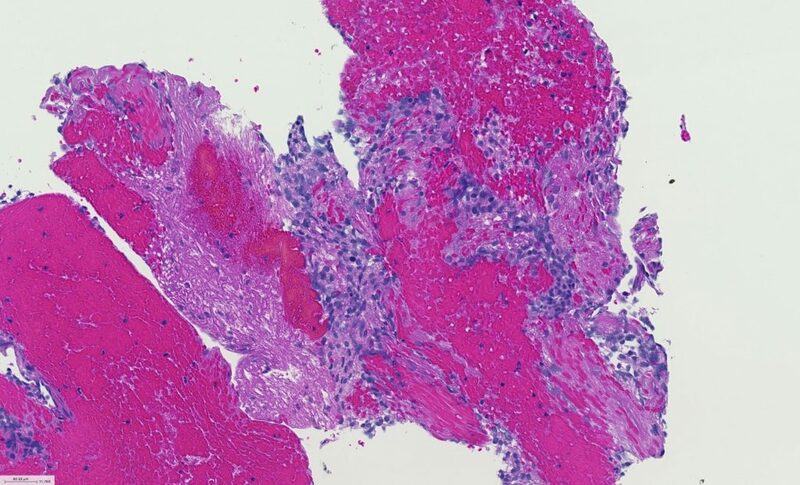 PTC-CMV is associated with familial adenomatous polyposis (FAP) (about 12% of FAP patients have PTC-CMV and 1 in 6 PTC-CMV patients have FAP), and the diagnosis of PTC-CMV can predate colon polyps. All patients with PTC-CMV should be screened for FAP. 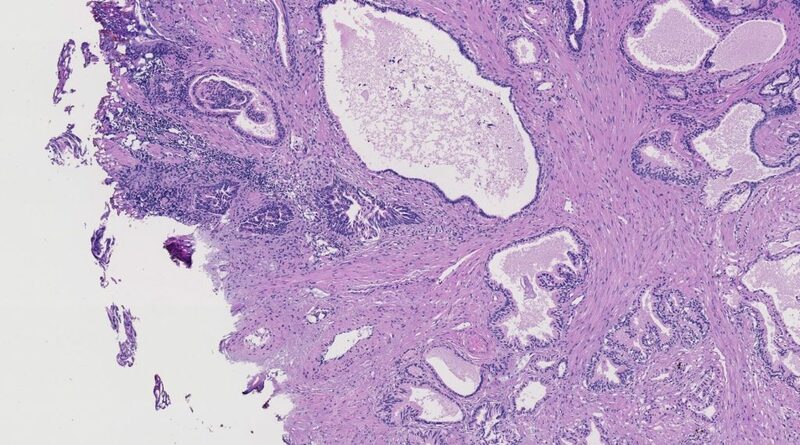 The tumor shows a wider range of morphologies than other PTC variants (cribriform, morular, solid, follicular, papillary, spindled) and classic nuclear features of PTC are not always well-developed. PTC-CMV overall has a low risk of metastasis and is typically not an aggressive PTC variant. The main differential diagnosis is with tall cell and columnar cell variants of PTC. 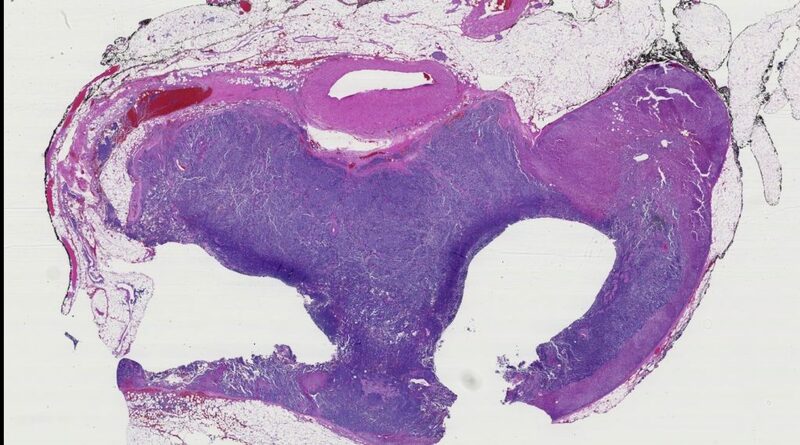 Hyalinizing trabecular tumor and metastatic carcinomas can also be considered. 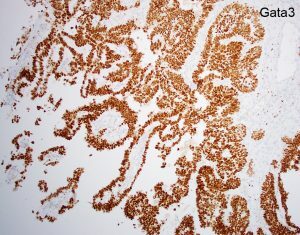 For diagnostic confirmation, IHC staining shows characteristic aberrant nuclear and cytoplasmic labeling for beta-catenin as well as ER and PR labeling. This is a TURP from a 65 year-old gentleman. 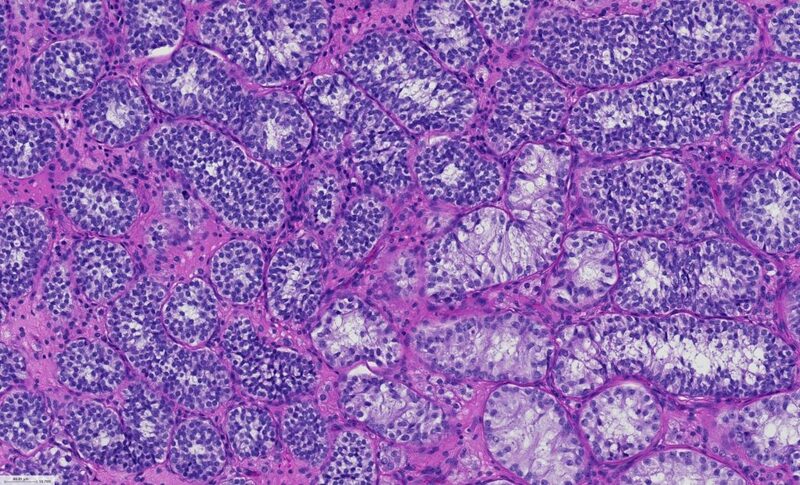 Histology: Nests of tumor cells arranged in an adenoid cystic pattern. Cells have small nuclei with inconspicuous nucleoli and scant cytoplasm. 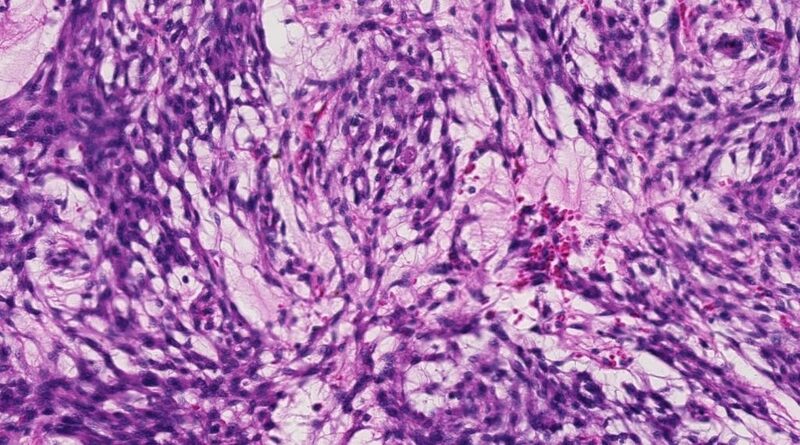 There is palisading towards the periphery of the nests and the center show cells with eosinophilic cytoplasm. 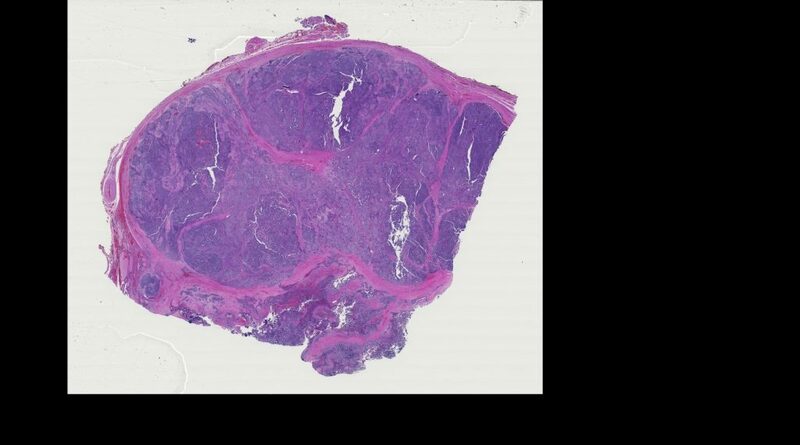 Discussion: Basal cell hyperplasia of the prostate can be difficult to differentiate from basal cell carcinoma. 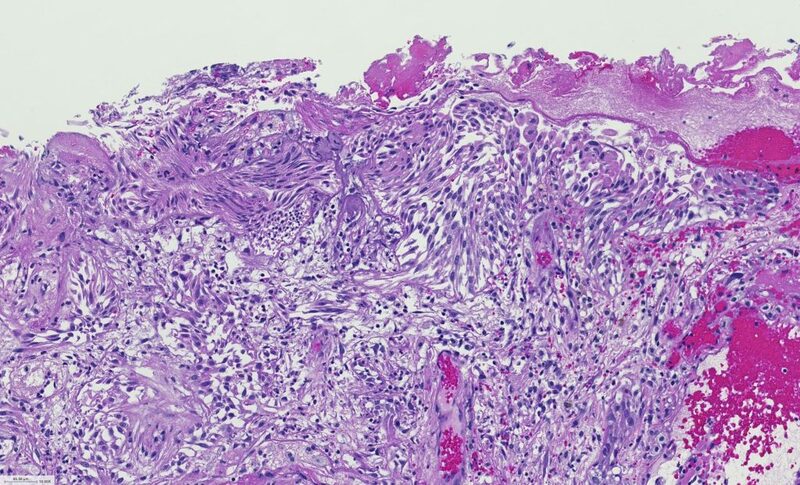 Adenoid cystic pattern, as seen in this case, is pathognomonic of basal cell carcinoma. 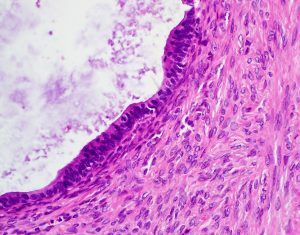 Other features characteristic of basal cell carcinoma but not hyperplasia include necrosis, anastomosing basaloid nests and tubules centrally lined by eosinophilic cells, variably sized nests with irregular shapes, extension into thick muscle bundles, stromal response, strong and diffuse Bcl-2 staining and Ki67 labeling index >20%. Only a small subset of basal cell carcinoma behaves aggressively. -Hum Pathol. 2015 Jun;46(6):805-12. doi: 10.1016/j.humpath.2015.02.004. Epub 2015 Feb 26. This is an 84 year-old woman with a kidney mass. 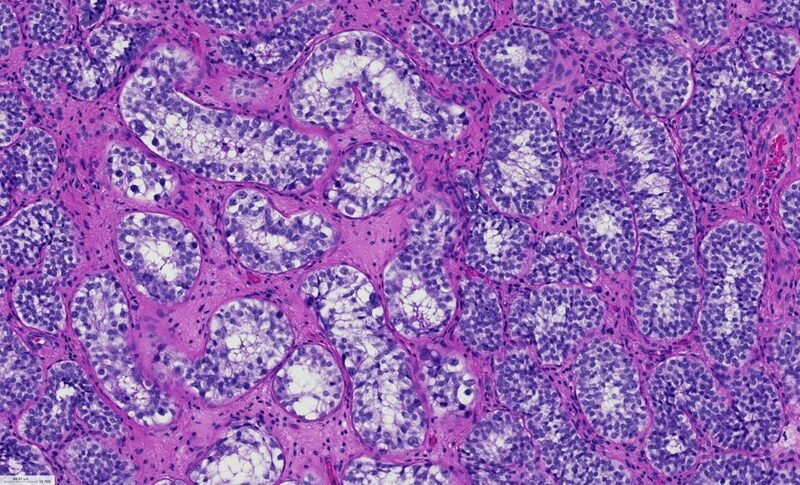 Histology: Solid and cystic mass with cysts lined by bland columnar/cuboidal to flat cells with occasional hobnail appearance. The stroma is arranged in a fibroadenomatoid/phylloidal pattern. Discussion: MESTs are more common in middle aged adults and with a strong female predominance (8:1). In male patients, there is often a history of hormonal therapy. Most are unifocal and the clinical presentation is that of any kidney mass. They are typically unencapsulated but well-circumscribed. 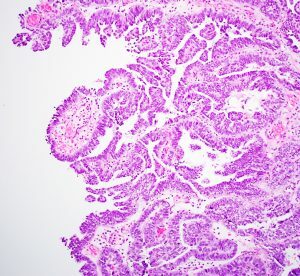 MEST and cystic neprhoma are considered within the same category of “Mixed epithelial and stromal tumour family” in the WHO classification of tumors of the Urinary System and Male Genital Organs. The epithelial component consists mostly of medium sized cysts and sometimes large cysts with phyllodes-type architecture. The lining cells can be flat, cuboidal, hobnail and rarely columnar with eosinophilic, amphophilic, or vacuolated cytoplasm. The stromal component can be occasionally markedly hypercellular with condensation around the cysts. 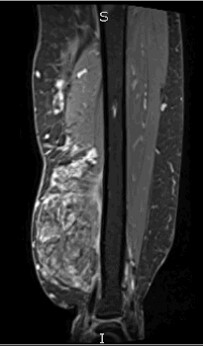 The main differential diagnosis should be with other mesenchymal tumors with entrapped tubules, particularly synovial sarcoma. 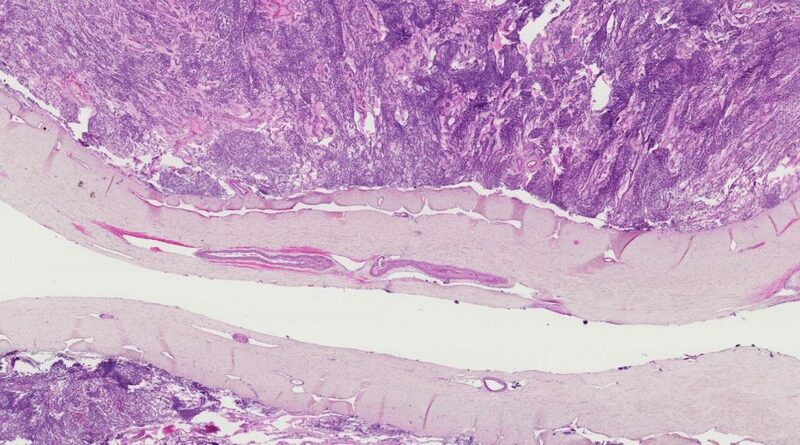 Lipomatous and smooth muscle differentiation can be seen. 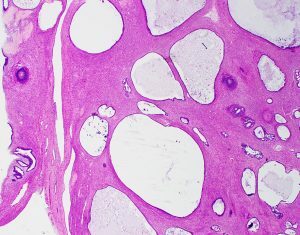 Ovarian-like stroma is often present and can undergo luteinization. Malignant transformation can rarely occur. Int J Surg Pathol. 2018 Feb;26(1):56-63. Am J Surg Pathol. 2016 Nov;40(11):1538-1549. 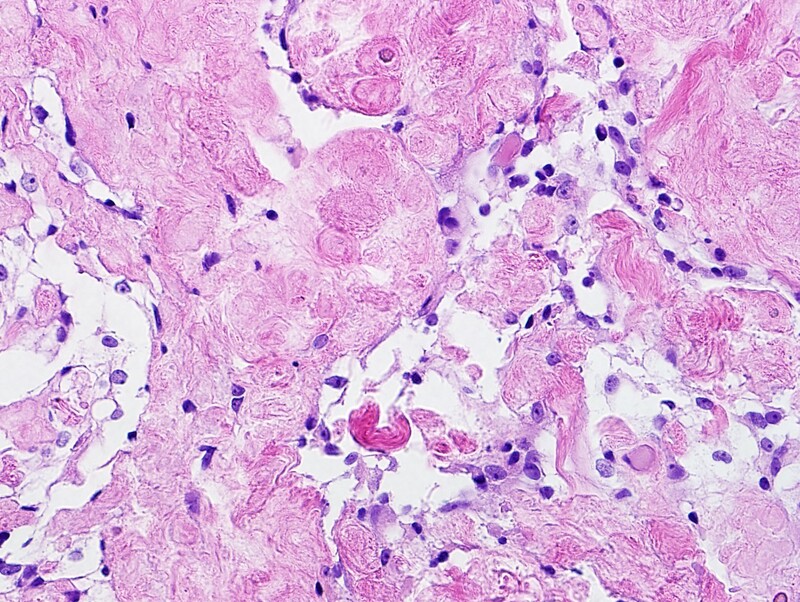 A 37 year-old gentleman presents with a 3.5cm kidney mass. 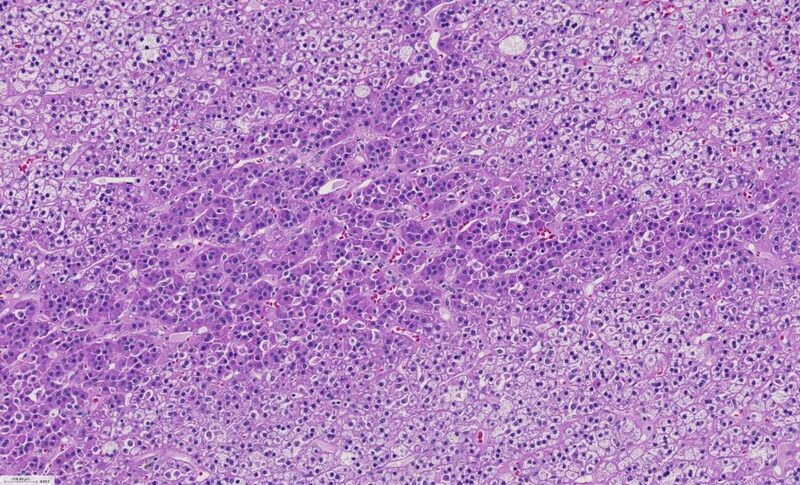 Histology: This is a well circumscribed tumor with cells arranged in nests or tubules in a hypocellular edematous background. Cells have abundant eosinophilic cytoplasm. The cells show degenerative nuclear atypia with bizarre large nuclei and clumped chromatin. There are no mitoses. 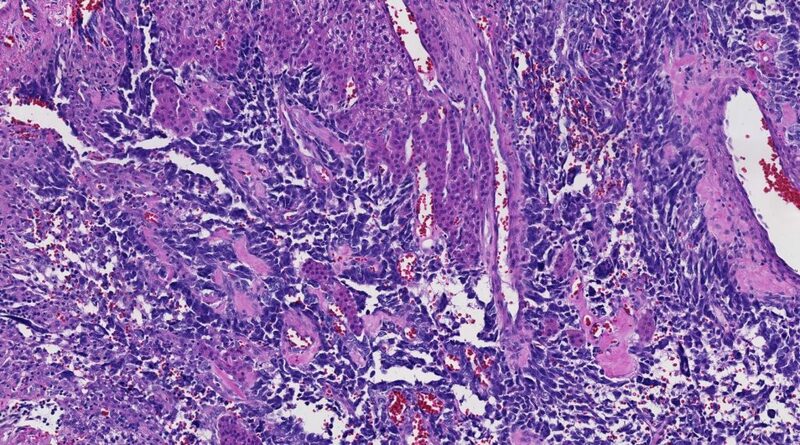 Discussion: Oncocytoma with degenerative nuclear atypia can be misinterpreted as carcinoma due to the bizarre nuclear features. Key is to recognize its degenerative appearance with clumped smudgy chromatin. 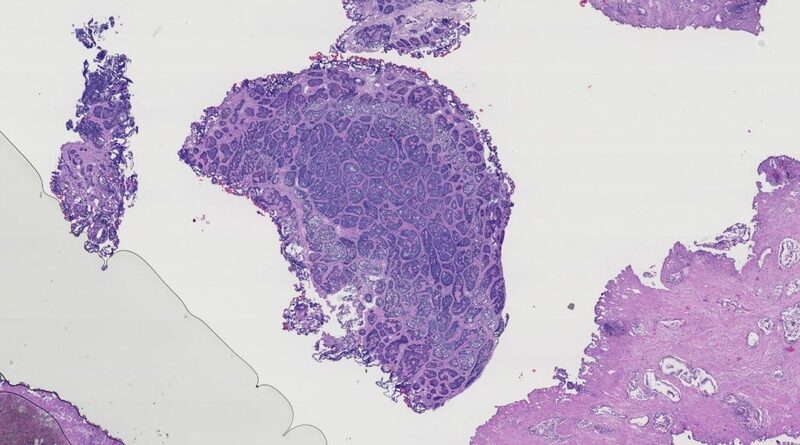 The presence of the following features should raise the suggestion of RCC with oncocytic features: Necrosis more than focal, papillary architecture, frequent mitoses, diffuse positive staining for CK7, AMACR, or vimentin. 54 year old male with an adrenal mass. This is a 54 year old male with an adrenal mass. 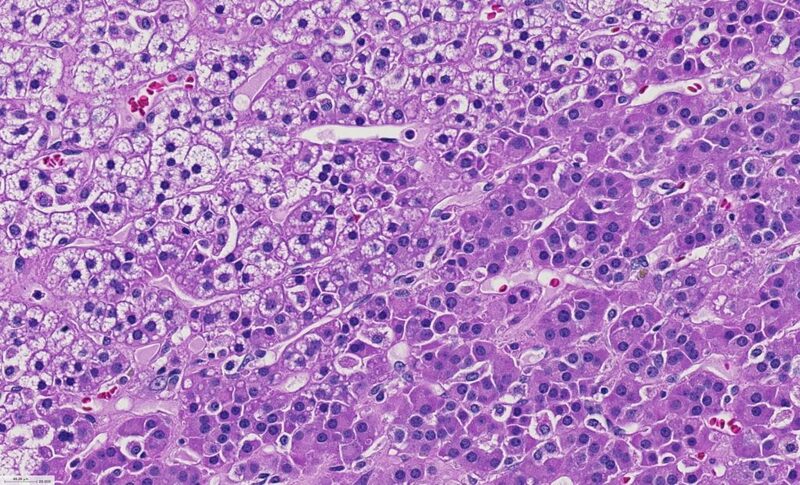 Histology: This is a high grade malignant neoplasm that features cells that are epithelioid and spindled within the adrenal gland. 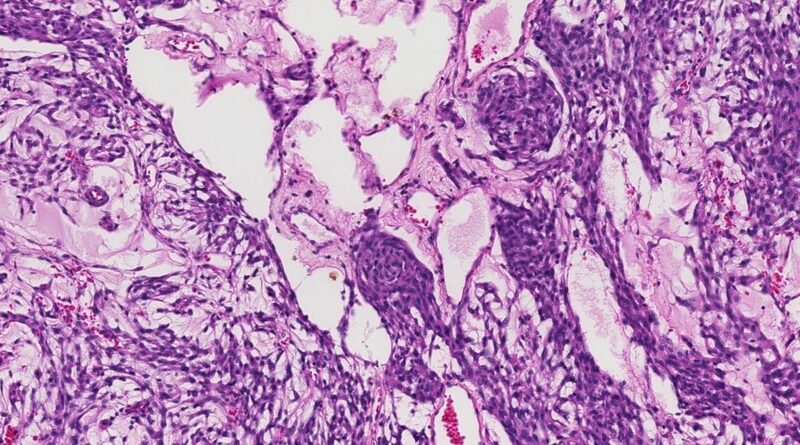 In some areas, the nuclei mold in the pattern of small cell carcinoma, and there are numerous mitotic figures that would support a high grade lesion. However, this patient had a history of malignant melanoma. 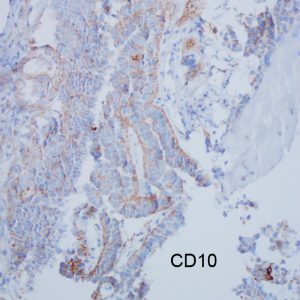 The lesional cells were negative for cytokeratin but diffusely immunoreactive for S100 and SOX10, supporting the diagnosis of metastatic melanoma. Discussion: The immunoprofile of diffuse S100 and SOX10 immunoreactivity in the face of negative cytokeratins, along with the clinical history, supports melanoma over small cell carcinoma. 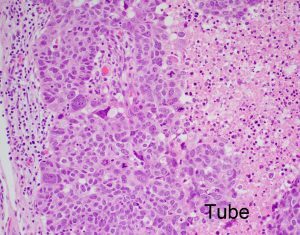 Pheochromocytoma would feature more amphophilic cytoplasm, and would be lower grade. Neuroblastomas usually occur in younger patients, and generally feature smaller, more round nuclei with a background of neuropil. 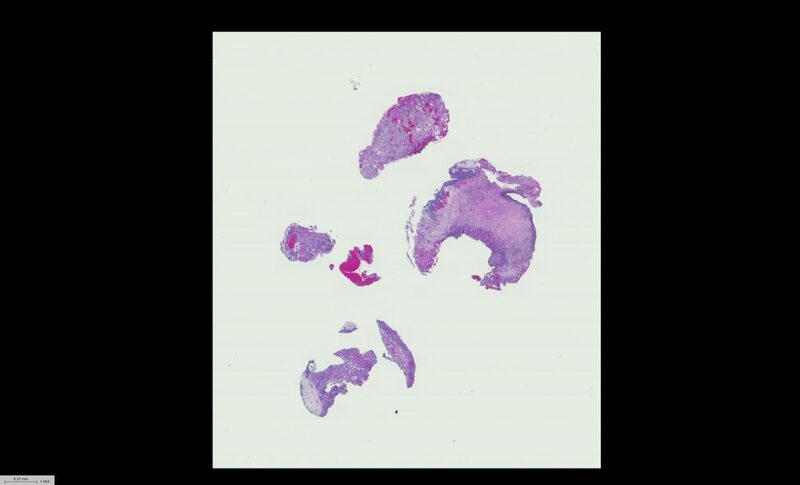 This case illustrates the ability of malignant melanoma to mimic a variety of lesions, including small cell carcinoma. 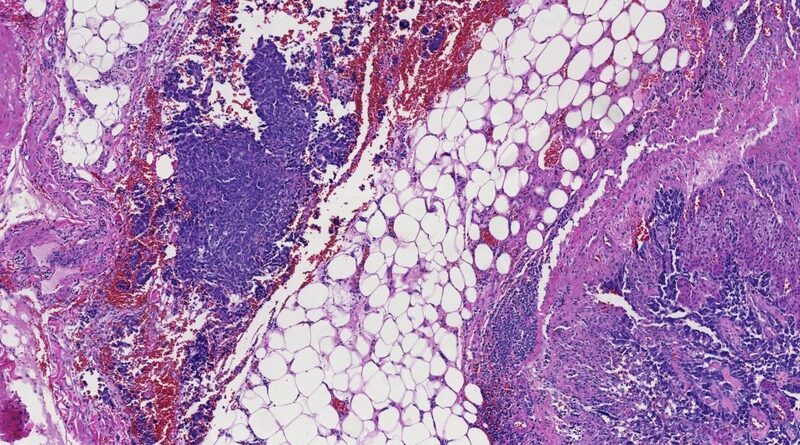 This is a 62 year old male with posterior neck mass. 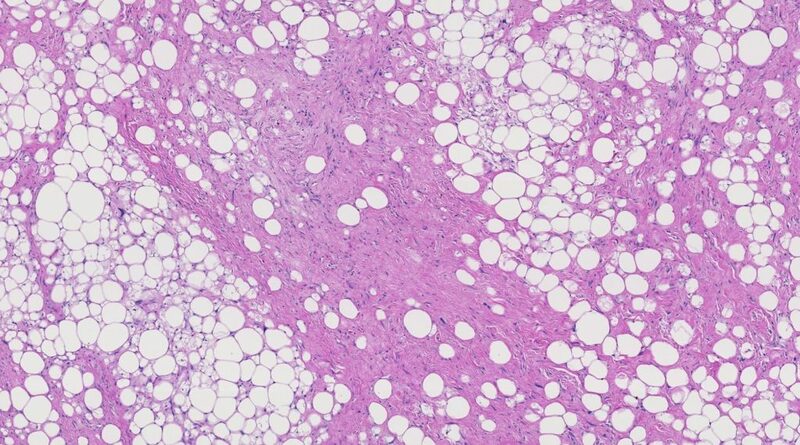 Histology: This is a well differentiated fatty lesion which demonstrates prominent lipoblasts, characterized by nuclei that are scalloped by cytoplasmic lipid. There are associated bland spindle cells with ropy collagen. The lesion lacks markedly hyperchromatic nuclei within fibrous septa, and is negative for MDM2. Instead it demonstrates diffuse labeling for CD34. These findings are diagnostic of pleomorphic/spindle cell lipoma. 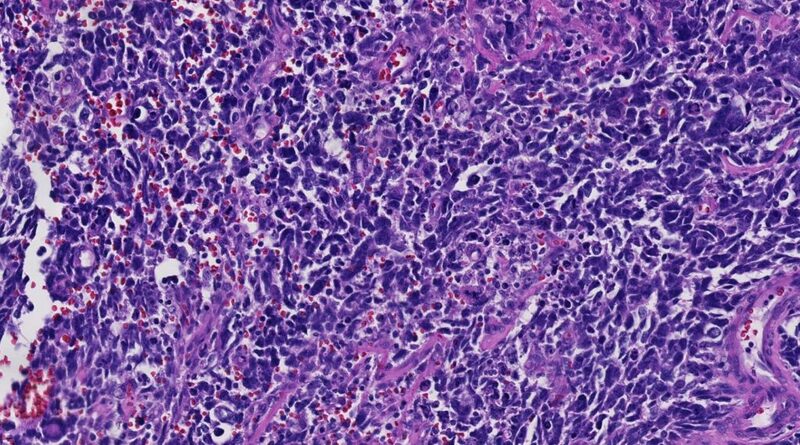 Discussion: Liposarcoma, well differentiated, would label for MDM2 and demonstrate hyperchromatic cells within the septa. 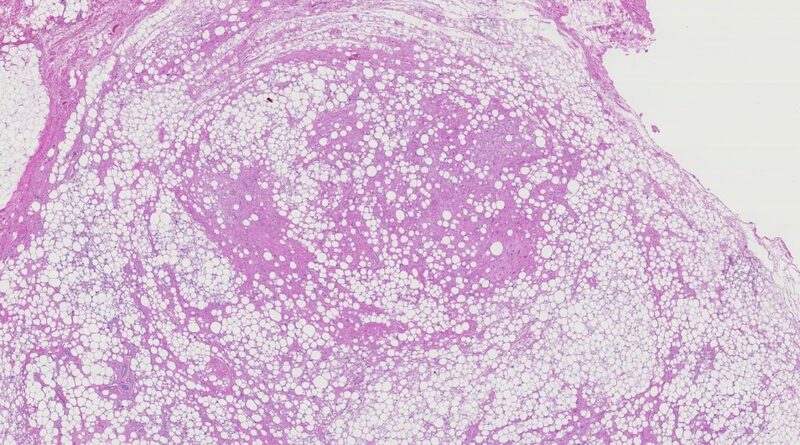 Fibrolipoma would lack the lipoblasts of the current case. Giant cell reaction to silicone material can result in appearance that simulates lipoblasts; however, there are no multinucleate giant cells in the current case, and no history of silicone exposure. 64 years old woman ECC with adenocarcinoma. TAH-BSO. The lesion in the fallopian tube. loss of cell polarity. 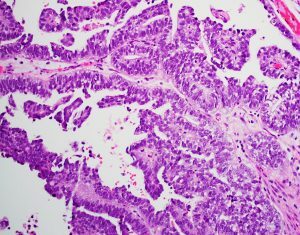 Accordingly, the tubal lesion is classified as high grade serous carcinoma (HGSC) arising in serous tubal intraepithelial carcinoma (STIC). 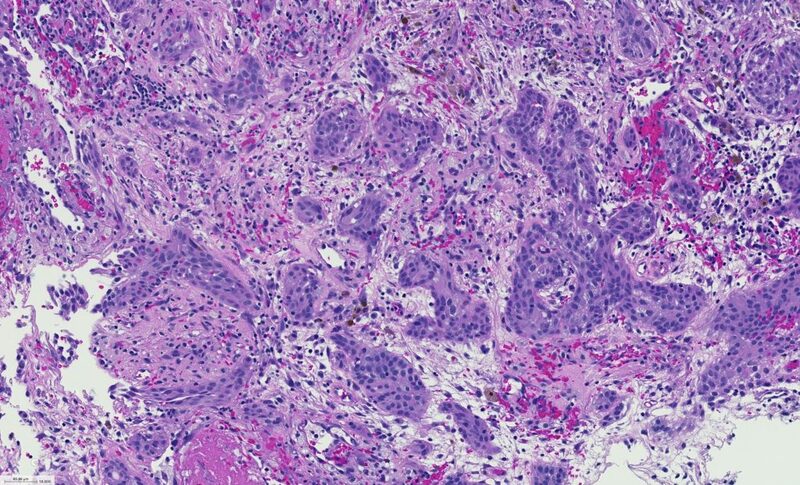 Differential diagnosis: The HGSC in the tube has a vague morphology overlapped with squamous component of adenosquamous carcinoma. 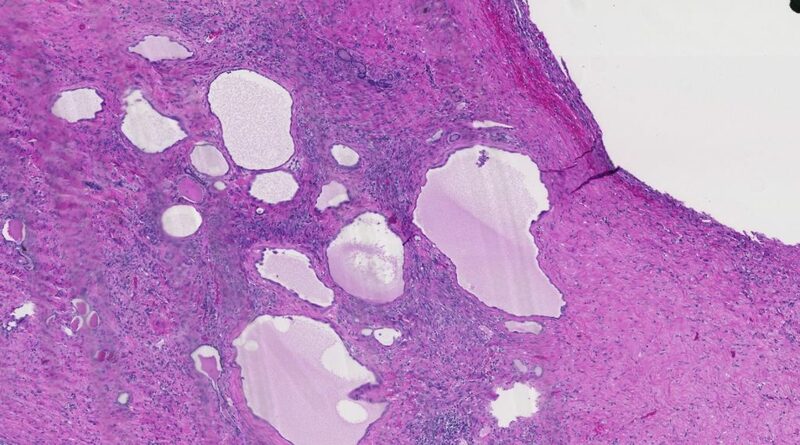 However, cytologic atypia in HGSC was much worse compared with that of squamous. 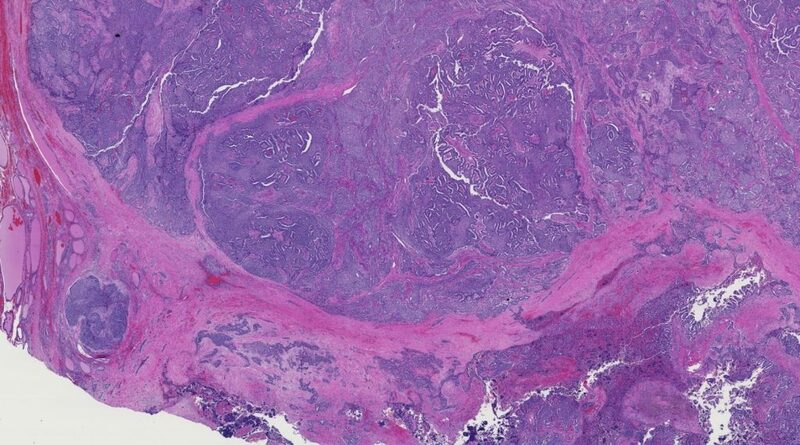 The presence of STIC is a critical hint for the origin of this tumor. HGSC in this tube shows a mutation form of p53 staining, a patchy p16 and positive ER and PR. 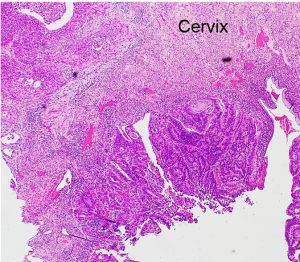 The cervical lesion expresses p16 strongly and diffusely, compatible with high risk HPV infection. P53 is wild type and ER and PR are negative. 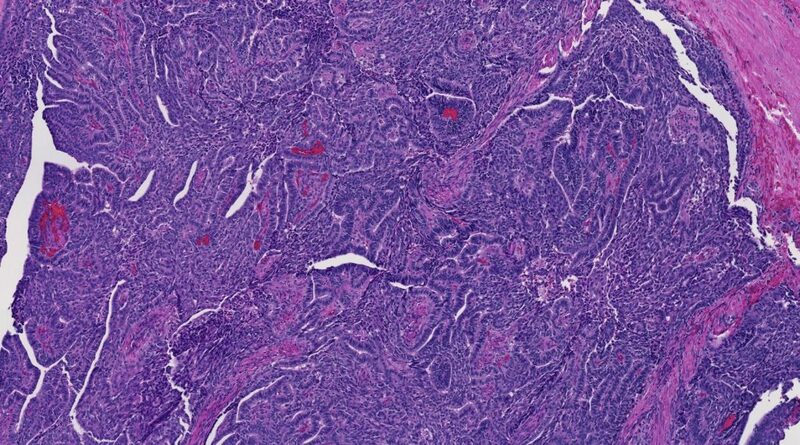 43 years old woman with unilateral 14 cm ovarian mass. No cancer history. TAH-BSO. 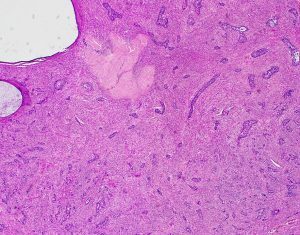 Histology: The tumor has a hybrid appearance with low-power endometrioid-like features but with apical mucin appreciable on higher power. The nuclei are hyperchromatic, elongated and diffusely atypical. Floating mitoses are readily recognized; apoptotic cells can also be appreciated at the basal portion of the glands. 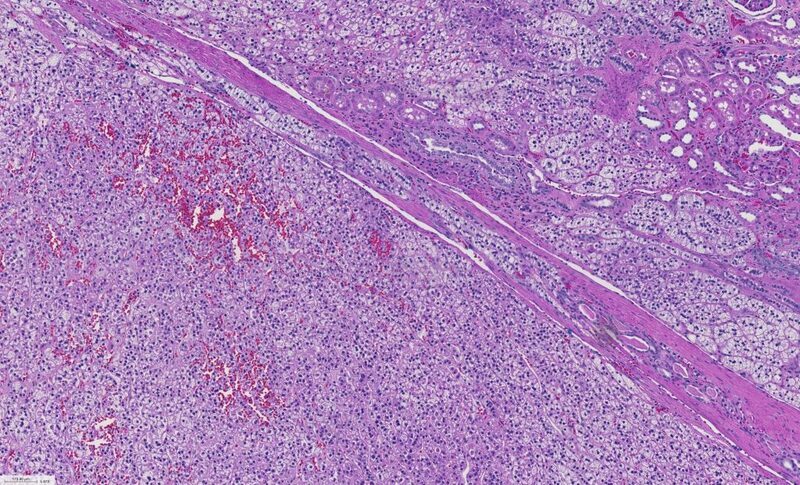 The areas with “Brenner tumor”-like distribution show highly atypical cells with features beyond that of benign Brenner tumor. These features plus strong and diffuse p16 as well as detected high risk HPV support interpretation as metastatic endocervical adenocarcinoma, usual type. 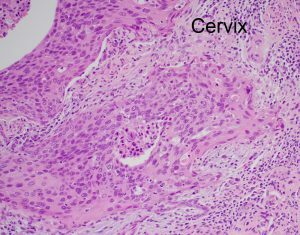 Two submitted sections from cervix are unremarkable. Examination of entire clinically non-suspicious cervix is recommended. 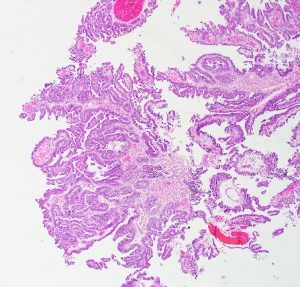 cysts and glands lined by simple, non-stratified mucinous epithelium resembling gastric foveolar-type or intestinal epithelium containing goblet cells. Mucinous cystadenomas may be associated with a dermoid cyst or Brenner tumor in around 10% of cases. 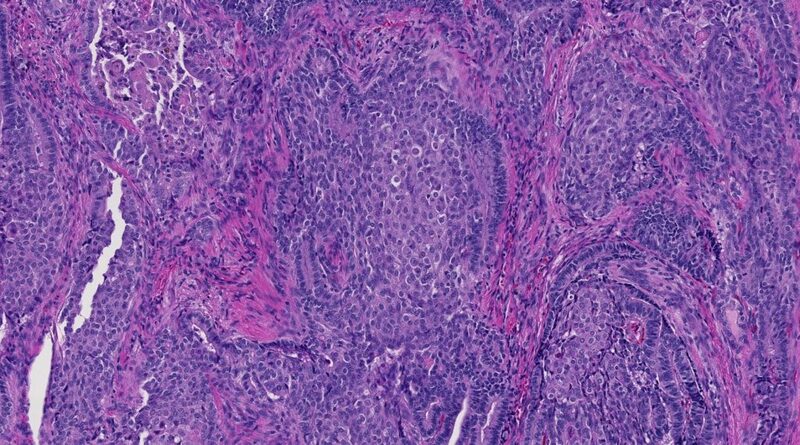 The features in this case may raise concerns for mucinous cystadenoma with intraepithelial carcinoma. 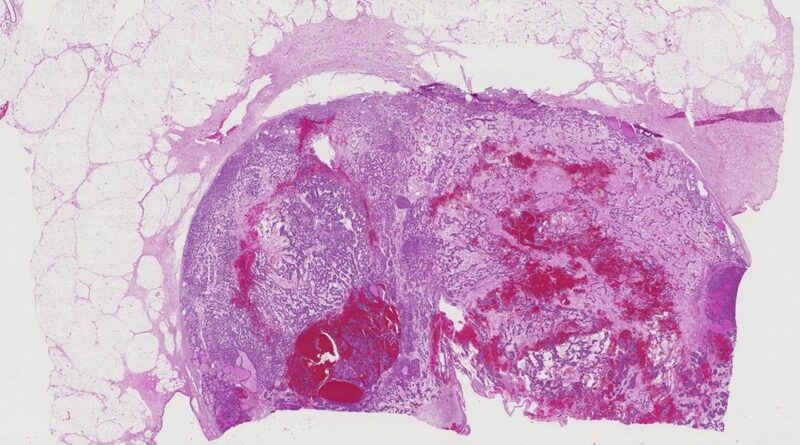 Strongly and diffusely expressed p16 and the presence of high risk HPV nail the diagnosis as metastatic endocervical adenocarcinoma, usual type. 50 year old women with cervical mass. 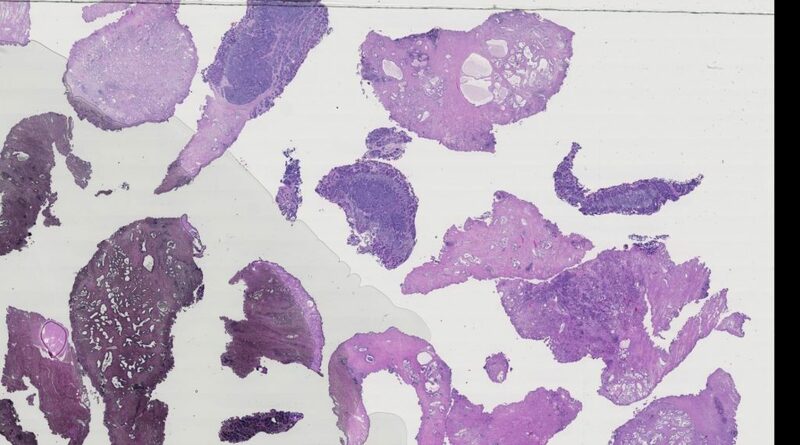 Biopsy specimen. 1. 50 years old women with cervical mass. Biopsy specimen. 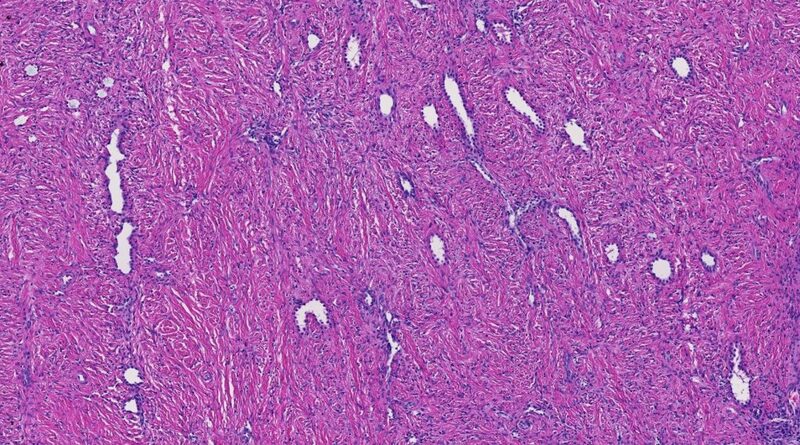 Histology: The tumor displays papillary structure, including the presence of central fibrovascular cores, lined by atypical cuboidal to columnar epithelium along the external aspect. The tumor cells are characterized by relatively bland cytology, a low level of mitotic activity, and focal cytoplasmic vacuoles. 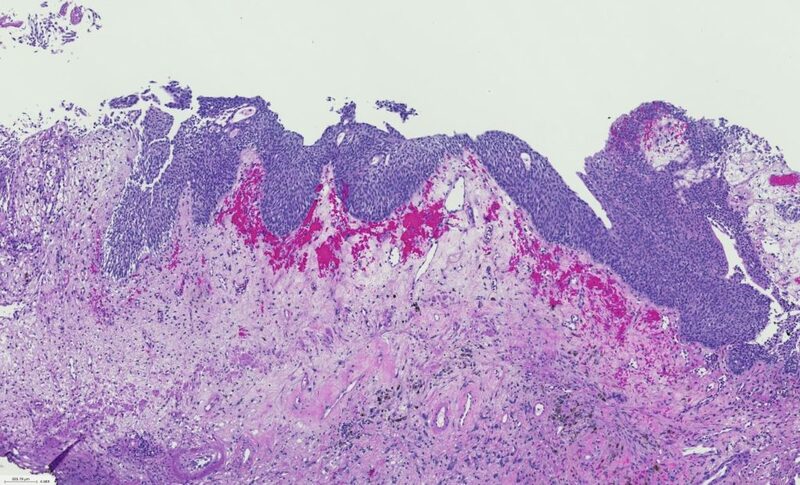 Given this non-specific morphology, the differential diagnosis is broad and appropriate addition of the immunohistochemical analysis is required to nail the diagnosis. 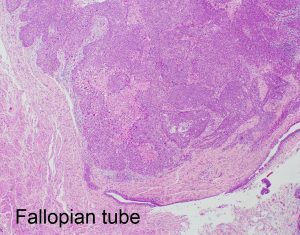 Differential diagnosis: The tumor diffusely expresses Pax8, and in this setting, supporting a gynecologic origin. 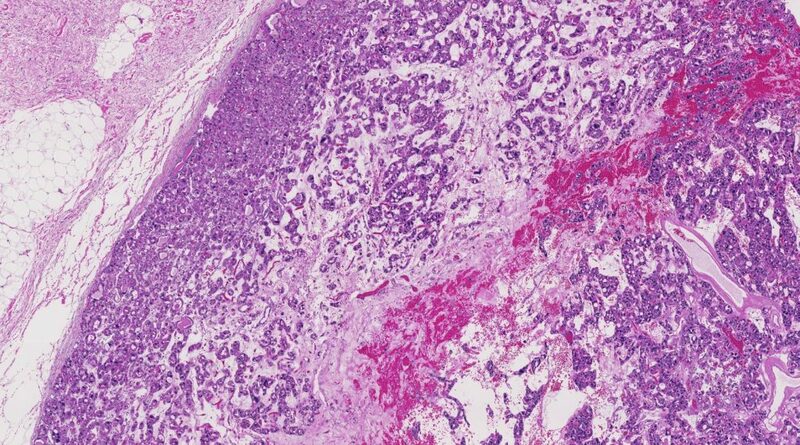 A patchy p16 excludes the possibility of endocervical adenocarcinoma, usual type. 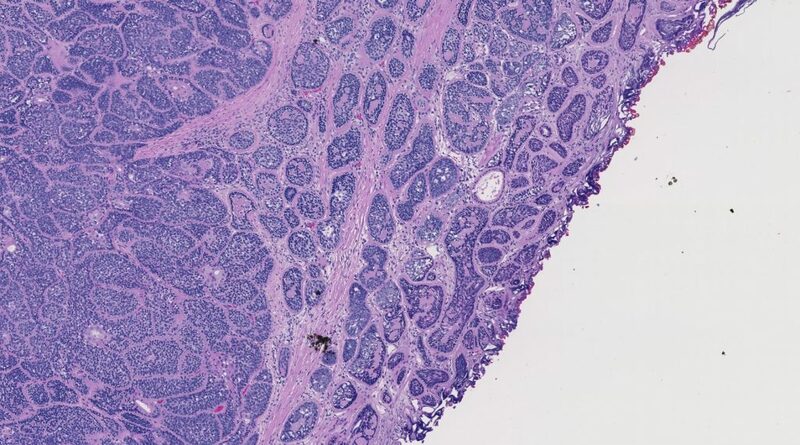 A wild type/normal expression of p53 makes uterine serous carcinoma less likely. 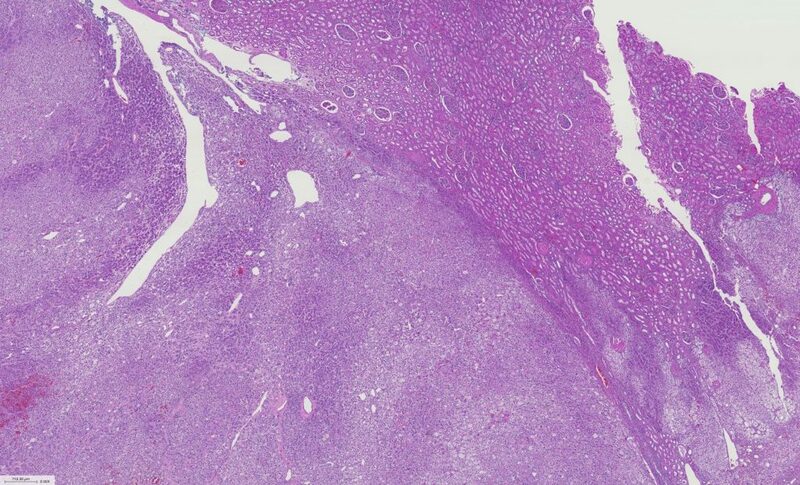 If this is an endometrioid carcinoma, it is FIGO grade 1 and mostly immunoreactive for ER and PR. This lesion is negative for both. Gata3 is strongly and diffusely positive, and CD10 has apical-lunimal staining pattern. 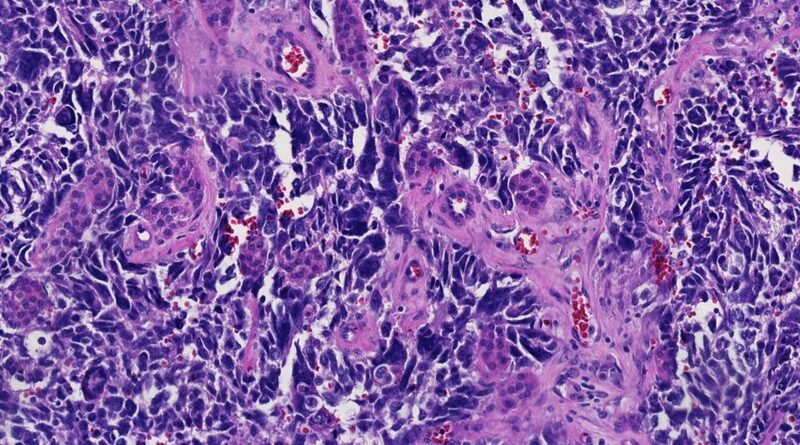 As such, the diagnosis is mesonephric carcinoma. 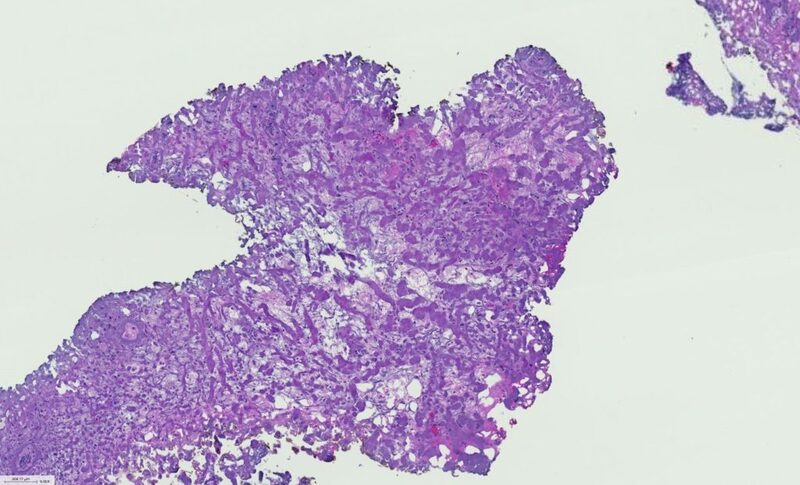 The typical morphologic features of mesonephric carcinoma are tubular glands lined by mucin-free cuboidal epithelium containing eosinophilic, hyaline secretion within their lumina. 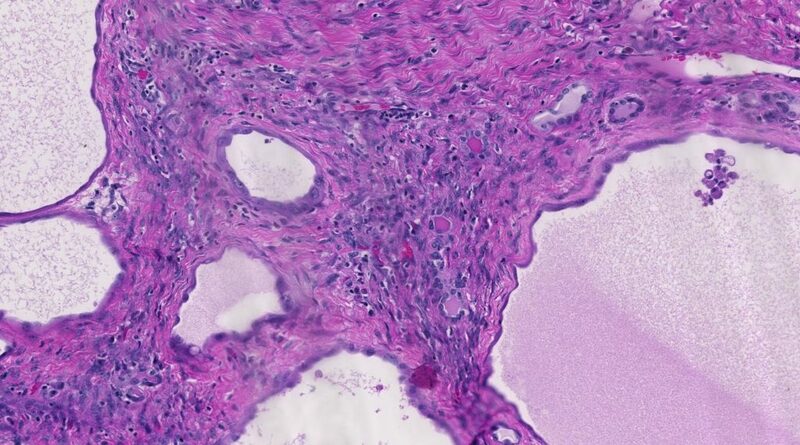 Rare patterns include branching, slit-like spaces with intraluminal fibrous papillae (retiform), solid, papillary, ductal, and spindle cell patterns. 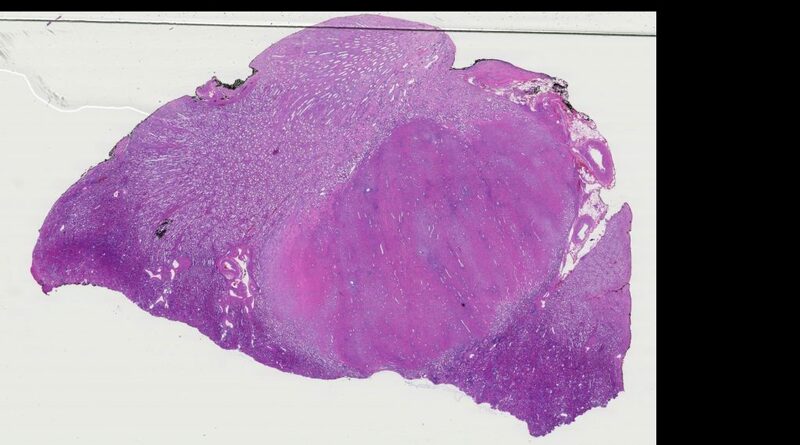 Soft tissue mass in an adult patient. 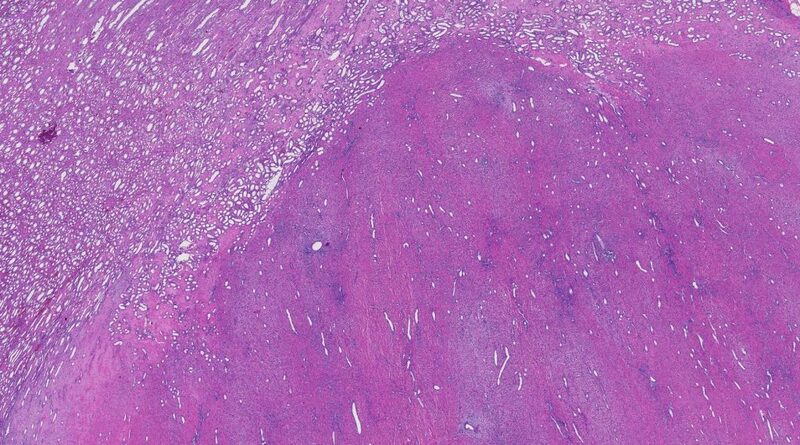 Histology: This large infiltrative mass involving the soft tissues of the calf is characterized by areas of variable cellularity and the presence of pseudomeissnerian corpuscles. Discussion: The findings supported a diagnosis of massive soft tissue neurofibroma, which occurs exclusively in the setting of NF1. Despite often having areas of increased cellularity, the neoplasm is predominantly low grade, with a low potential for malignant transformation. 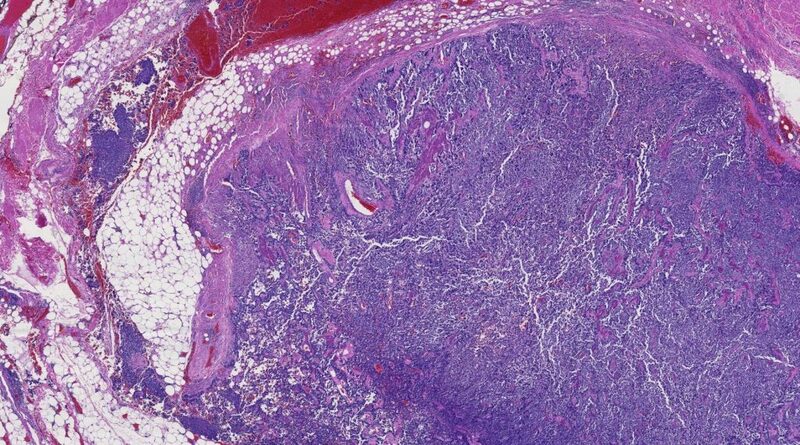 The caveat is that it may overlie and be associated with a plexiform neurofibroma which does have a higher risk for malignant transformation(1). 1. Antonescu CR, Scheithauer BW, Woodruff JM. Tumors of the Peripheral Nervous System. Silver Spring, Maryland: ARP press; 2013. A 48 year-old male developed a uniformly enhancing mass involving the left cerebellopontine angle. A 48 year-old male developed a uniformly enhancing mass involving the left cerebellopontine angle. What is the clinical significance of this morphologic variant? 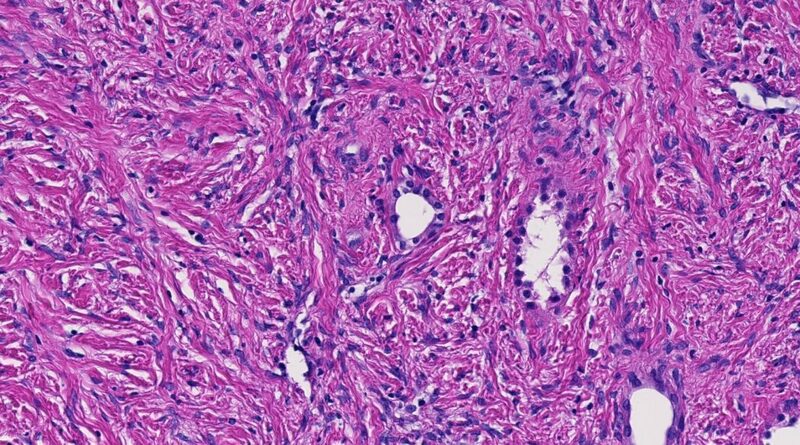 Histology: Histologic sections demonstrate a bland meningothelial neoplasm with cytoplasmic clearing, and a stroma composed of “blocks” of dense collagen. The findings support a diagnosis of clear cell meningioma. 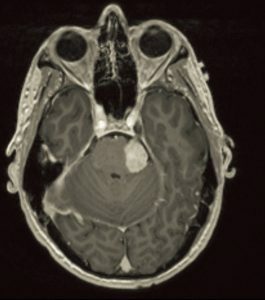 Discussion: Despite its bland appearance, clear cell meningioma is associated with a higher recurrence rate and is therefore assigned a WHO grade II diagnosis (1). 1. Zorludemir S, Scheithauer BW, Hirose T, et al. 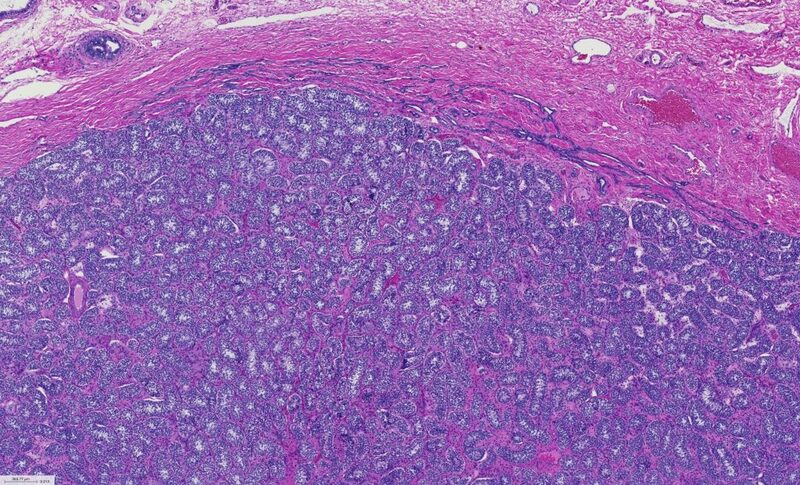 Clear cell meningioma. A clinicopathologic study of a potentially aggressive variant of meningioma. Am J Surg Pathol. 1995;19:493-505.